The Render section of the Settings window allows adjusting the rendering settings of the world. 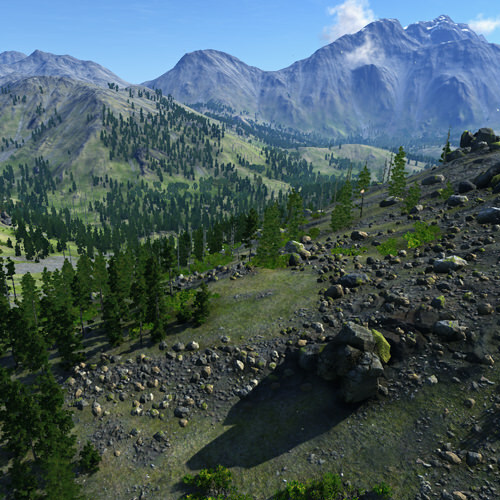 It contains the basic rendering settings (rendering distances, reflection, wireframe and background colors, fields for the post-materials specification, etc.). Also it has a set of items given below. Parameters — the vegetation animation parameters applied across the whole world. TAA — the settings of the temporal anti-aliasing (TAA). Shadows - the settings of the scene shadows. 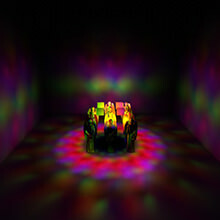 Global Illumination — the settings of the global illumination including SSAO (screen-space ambient occlusion), SSGI (screen-space global illumination) and bent normals. SSS — the settings of the subsurface scattering. SSR — the settings of the screen-space reflections (SSR). 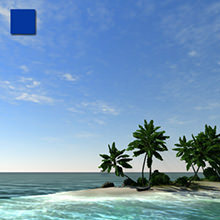 Water — the settings of the water screen-space reflections (SSR). Clouds — the settings of the clouds. Environment — the settings controlling environment of the scene (scattering, haze, etc.). Postprocess — the settings of the rendering post-processeses: refraction, FXAA, and volumetric shadows. 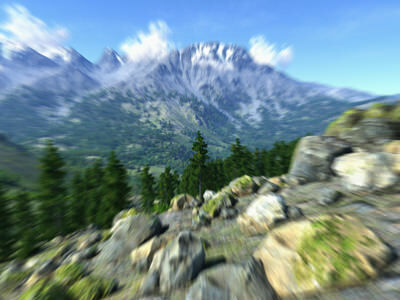 Motion blur — the settings of the motion blur rendering post-processes. DOF — the settings of the depth of field (DoF) effect. Camera Effects — the settings of the camera. Color — the scene color correction settings. Make sure that you've disabled all post-effects (SSAO, SSR, SSS, Bloom, DoF, Bokeh) on all the multi-monitor configurations. Global distance scale for all distance parameters, such as the world rendering distance, decal distance, field distance, light distance, object distance, clutter distance, reflection distance, LODs and surfaces visibility distances. This option allows a developer to easily increase or decrease rendering performance by changing the world extent. Distances are measured from the camera to the nodes's (surface's) bound. For example, if the maximum visibility distance of a LOD is 10 meters, and you set Distance Scale = 2, the LOD will disappear at the distance of 20 meters, not 10. Increasing the value leads decreasing performance. The maximum recommended value is 4. Distance from the camera, from which (and farther) fields are not rendered. The distance is measured from the camera to the field's bound. If the value is greater than the World Distance value, the latter will be used instead. Distance from the camera, from which (and farther) decals are not rendered. The distance is measured from the camera to the decal's bound. If the value is greater than the World Distance value, the latter will be used instead. 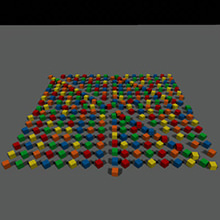 Distance from the camera, from which clutter objects are not rendered. The distance is measured from the camera to the clutter's bound. This setting works only for Mesh Clutter objects when their culled by clutter tree flag is set. This setting does not work when the collider object flag of the node is set. If the value is greater than the Object Distance value, the latter will be used instead. Distance from the camera, from which reflections from environment probes are not rendered. 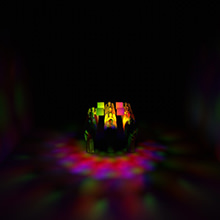 Distance from the camera, from which the dynamic lights are not rendered. The distance is measured from the camera to the light's bound. If the value is greater than the World Distance value, the latter will be used instead. Distance from the camera, from which objects are not rendered. The distance is measured from the camera to the light's bound. If the value is greater than the World Distance value, the latter will be used instead. 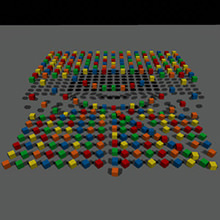 Distance from the camera, from which the shadows from light sources are not rendered. The Distance Scale parameter doesn't affect this value, so you need to adjust the shadow distance in parallel with the distance scale. Increasing the value produces blurred shadows. Render creation time budget in frames per second. 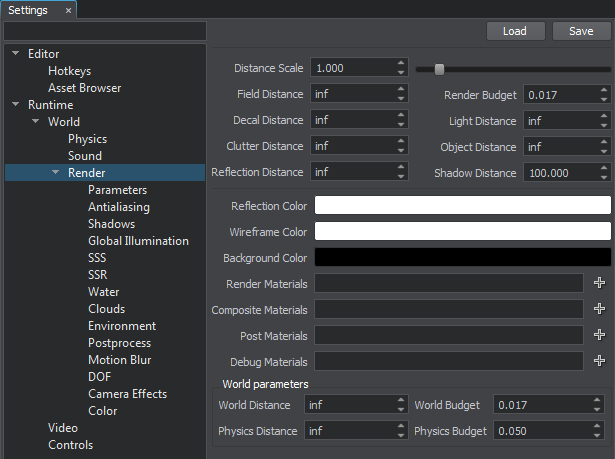 The render budget limits the number of loaded / created graphics resources during frame according to the loading/creation time. Color of all reflections produced by environment probes. For example, by using the parameter, you can make red reflections at sunset. Distance from the camera, from which physical interactions will not be calculated. All physics-based nodes freeze if the distance between them and the camera is bigger than the Physics distance. The distance is measured from the camera to the node's bound. Physics simulation time budget in frames per second.